BANGI, 25 Oct. 2010 – UKM has strengthened its overseas presence when 18 post graduate students in Public Health and Hospital Management at the Yemen University of Science and Technology (YUST), graduate early next month. They are the first batch of graduate students taken under the joint UKM-YUST programme when UKM launched its first international branch campus overseas, said the Deputy Vice Chancellor (Academic and International Affairs) Prof Dato’ Ir Dr Hasan Basri. Prof Hasan who will represent UKM at USTY’s convocation on the 4th of November, said with the success of the two programmes, UKM plans to expand the courses offered to also include business administration, engineering, science and information technology. 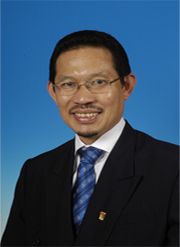 “This in line with UKM’s strategy of focusing on post-graduate studies. We do have joint programmes with other foreign universities but we are focussing on the masters programme with YUST,” he told UKM News Portal. The co-operation with Yemen is part of UKM’s effort to help members of the Organisation of Islamic Conference (OIC) who are stil not developed but have vast untapped human resources with the potential to grow. Yemen have capable human resources besides its oil and gas reserves but is still under-developed especially in tertiary education. However its primary and secondary education sector is quite developed. Yemen and its merchants especially from Hadramaut facing the Arabian Sea have had very close relationship with people in this region. “These merchants are the ones who helped spread Islam to the Malays in coastal states of the region before the advent of the European colonialists,” he said. Professor Dr Noor Hassim Ismail, the Head Occupational Health Consultant, UKM Medical Centre said the 18 students are medical doctors, dentists and a few nurses. They are working professionals and study on a part-time basis. Lesson are spread over 18 months divided into three semesters with modules prepared by UKM covering family, occupational and environmental health. “Lessons taught are tailored towards the local situation in Yemen. We also give special attention to modules such as hospital management and economic health,” he said. Prof Dr Noor Hassim said UKM provides two specialists who are stationed in Sanaa to conduct classes. “It is a good experience for our lecturers since they are stationed in a vastly different place from ours or the developed countries. “Yemen is somewhat underdeveloped and categorised as among the poor countries. What we are doing is to extend a helping hand to a brother Muslim country to develop its tertiary education,” said Prof Noor Hassim.